Known as ‘the islands of smiles’, the Tiwi Islands sit 80km north of Darwin, Australia. Comprising Melville, Bathurst and 9 smaller uninhabited islands, the indigenous people have occupied the Tiwis for almost 7,000 years. You can only visit the Tiwis if you have booked a tour in Darwin. They are well worth a visit as it’s a truly fascinating culture shift from the mainland. The islands have a tropical monsoonal climate, with the rainy season falling between November and April. Around the islands you’ll stumble across unique features such as tall burial poles with vibrant paintings and neat carvings of mythological creatures, known as ‘pukamanis’. There are a few indigenous art centres on the islands, most notably the Heritage Gallery on Bathurst Island. Here you’ll find intricate and colourful wood carvings of various birds. The Tiwi people believe they give warnings for rain and cyclones. A visit to the Patakijiyali Mueseum in Wurrumiyanga is a must, as it offers a detailed insight into the islands’ and indigenous people’s history. Apart from the art centres and museums there are limited tourist facilities and places to stay on the islands. You can, however, find accommodation in one of the remote fishing villages. Australian Rules football is hugely popular among the islanders and catching the locals showcasing their skills makes for excellent viewing. The sport is so popular in fact, that the Tiwi Football Grand-Final Day in late March is the only time visitors are allowed without a permit or tour. Remember to book your ferry tickets well advance if you wish to visit at this time. The Tiwis are home to an array of interesting wildlife. It has the largest breeding colony of crested terns in the world and a large number of vulnerable olive ridley turtle. Along the coastline you’ll find everything expected from a tropical island. There are lush forests teaming with wildlife, sandy beaches, secluded waterfalls and refreshing rock pools. Saltwater crocodiles inhabit the area so travel with caution! There is one ferry route departing from Cullen Bay in Darwin and arriving in Wurrumiyanga on Bathurst Island. 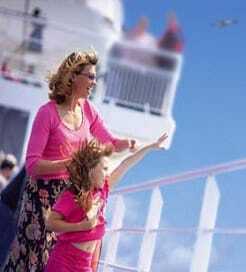 The journey lasts around 2 hours 30 minutes, with 3 sailings a week. The route is operated by Sealink Northern Territory who provides high speed catamarans complete with sun decks, bars, televisions and comfortable seating. For more information, please visit our Ferries from Australia to Tiwi Islands page.